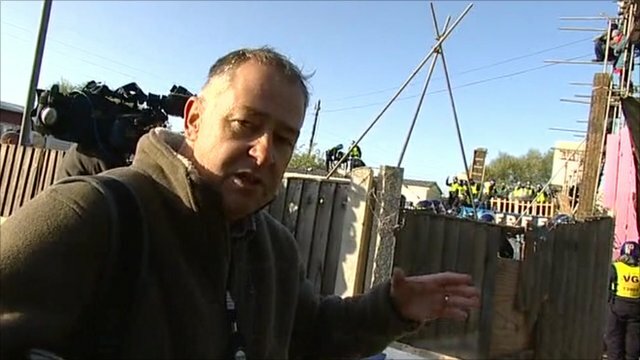 BBC's Mike Sergeant: "One by one the police are trying to get these protesters down off the gantry"
Bricks and debris were thrown at police as officers moved into Dale Farm amid violent scenes to secure the illegal part of the travellers' site. One person was Tasered and seven arrested as police moved through the former scrapyard in Essex - the largest travellers' site in the UK. Officers in riot gear broke down a rear fence, prompting angry scenes. 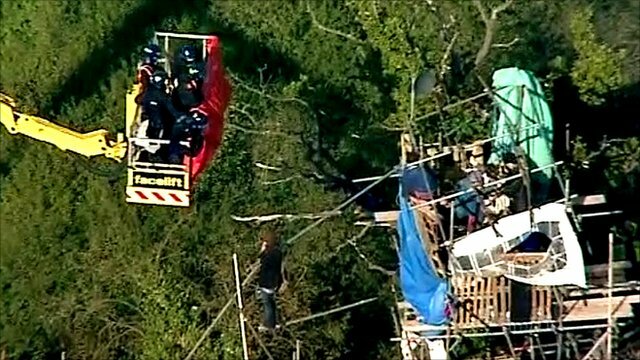 The travellers lost a final attempt on Monday to stave off the evictions, but protesters pledged they would fight on. Officers have now begun removing protesters from the 40ft (12m) high scaffolding on the gate. Earlier, police entered the back of the site during discussions, described by supporters as a distraction, at the main gate. One caravan was set on fire. Electricity supplies were cut and protesters wearing masks said this had turned off crucial medical equipment belonging to elderly residents. One resident said she had been hit by a baton. The ambulance service confirmed a woman had been taken to hospital with a back injury. Two people were treated for smoke inhalation, one for a nose bleed and one for chest pains but there was no evidence it had been a heart attack, an ambulance spokesman said. An Essex Police spokeswoman said on Wednesday afternoon that the situation had "reached a considerably more calm state than officers were faced with this morning". She said the arrests had been for offences including violent disorder and a breach of the peace. The spokeswoman added it was now believed only one person had been Tasered, not two as previously reported. "We are aware a small number of people on the site have been treated for minor injuries and one woman has been taken to hospital for treatment to a minor back injury," she said. Speaking at a press conference, Supt Trevor Roe said: "The tactic was to take early control of the site. "Where we have intelligence there is likely to be violence we need to protect members of the public including bailiffs, police officers, travellers and protesters from injury. "We also needed to provide access for all emergency services should they need to enter and exit the site. He said two officers had deployed a Taser after being threatened with violence. Police said they had received reports that bottles, liquids and bricks had been stockpiled and this was a threat to the public, including bailiffs and council workers. The BBC's Jeremy Cooke, inside the camp, described the early morning entry by police as a "very dramatic situation". He said the protesters were "heavily outnumbered by the police". 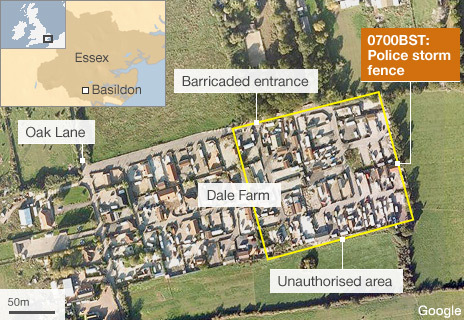 Police arrived at Dale Farm at first light, when they streamed through a rear perimeter fence in riot gear. An alarm siren sounded inside the perimeter and protesters gathered at the main gate rushed to the eastern side of the site where police were streaming in. They engaged in hand to hand fighting with the officers who had come across the adjacent fields. The operation was entirely police led and they were moving at jogging pace, driving back the protesters in a running battle. Well in excess of 100 officers pushed people aside as they made their way through the site and I saw one traveller dragged and unceremoniously dumped. Within 15 minutes they had complete control but I did not see a single bailiff with them. Ranks of officers, including many from the Met force, lined up in front of the main gate and its gantry which has now become the symbol of the fight. They were pelted with bricks, bottles and other debris and used riot shields above their heads as protection. Resident Nora Egan said she had been struck as she told police they were not entitled to break down fences. 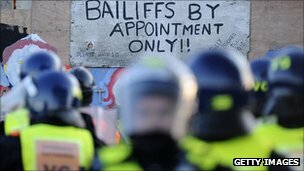 She said: "This is being led by the police, there is no sign of bailiffs." Resident Kathleen McCarthy said: "The memory of Dale Farm will weigh heavily on Britain for generations - we are being dragged out of the only homes we have in this world. "Our entire community is being ripped apart by Basildon Council and the politicians in government." But police said consistent attempts had been made asking protesters to leave the site peacefully. The eviction, which could cost up to £18m, marks the end of a 10-year battle between travellers, who bought a former scrapyard on green belt land in 2001 and established their caravans there, and the council. More travellers joined them and some semi-permanent chalet dwellings were built. Over the past few days, travellers and their supporters have reinforced the perimeter of the 49 illegal plots at the site. He said: "These are utterly disgraceful scenes and demonstrate the fact some so-called supporters were always intent on violence. "Nonetheless we are going to press on with this operation with our partners in a safe, dignified and humane way and will uphold the law." He said that "alternative bricks and mortar accommodation" offered to the travellers had been turned down." The council's initial application to have them evicted began a series of legal cases which saw the local authority and the travellers explore every part of the justice system to settle the dispute. As appeals were made by the travellers on humanitarian, medical and other grounds it became apparent they would have to go. Conservative MP for Basildon John Baron said: "Police are using the minimum force required and when you are being pelted with bricks and rocks you are entitled to defend yourself." Labour MEP Richard Howitt said: "The smoke above Dale Farm is the most visible sign of the failure of Basildon Council to seek a mediated solution."